BigFish is a very dynamic and aggressive company – and most of the time it’s good as they give competitive services to their customers, earn a lot of money for the developers and help expand the casual games market. Unfortunately an aggressive strategy sometimes might get out of hand and you might unintentionally cross the line – that’s what I believe happened in our case. Seattle, WA, June 26, 2008 –(PR.com)– Big Fish Games™, the world’s leading online destination for casual entertainment, announced today the release of Ancient Quest of Saqqarah, a new casual game available exclusively from Big Fish Games. Ancient Quest of Saqqarah is a Puzzle game with motion picture quality in story, sound, and script adding a new level of superiority to classic Match 3 play. In the game, players travel back to Saqqarah, an ancient Egyptian dwelling, where an eclipse transpires over a mystic pyramid every thousand years. Below the pyramid’s sands, a magical underground oasis is filled with puzzles, treasures, and legends. Players are tasked with fulfilling an old Egyptian prophecy to stop the evil god Seth from breaking out of his arcane tomb prison. In order to succeed, players must master seven distinct types of puzzles along with mini-games spread over 500 hand-crafted levels. 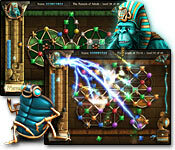 Players begin in the temple of Isis, swapping neighboring tokens by clicking on three or more items of the same kind. Throughout several stages, the objective is to light the entire board by making combos over the dark areas. Ancient Quest Saqqarah is an innovative Match 3 game in the way it lets players make matches vertically and horizontally in one simultaneous move adding an entirely new experience. After five strong matches, an explosive fireball is hurled into the board by Khufu, the summoned monkey, for a “Mega Sweep.” Players also experience bonus points with the Pharaoh’s Combo and Desert Combo. When earned, a Shuffle option is available to reconfigure the board for additional matches. Unparalleled high-definition graphics along with motion picture-quality sound create a highly-immersive Puzzle experience. Download Ancient Quest of Saqqarah today at Big Fish Games. The trial version can be downloaded for free; the full version is available for $19.95 (U.S.). That was the personal part, but wait – there is much more interesting ahead! Recently we have learned that much is going to change in the landscape of exclusive game releases where BigFish is king. Soon, If you are going to give a single publisher even a short term exclusivity (two weeks for example) most other portals will not accept your game at all. IWin has written about it here as they are implementing this strategy in full force as of August 1, 2008. During the last week we’ve already received several emails from other major publishers who want to follow. I hope that we manage to launch Saqqarah on most of the major channels before the new standards settle, but for what it is worth I personally vote in support of such changes. To be frank with you, exclusivity deals are only a tip of the iceberg in this case. Most developers and publishers don’t approve of certain distribution strategies. As it turns out some distributors (BigFish again being the finest example) are shipping insane amounts of games at discount prices. This turns out to be especially bad for developers and their brands and basically it is bad for the whole industry. I regret that I have learned all of this only recently. If we had realized it earlier we would probably change our publishing strategy with Saqqarah or maybe even with StoneLoops. After all, if you think about it for a second we, developers should give preference to portals that support full price sales, and treat anyone who sells our games at discount rates as lifecycle portals that don’t get our game from day 1. In fact this is an advice we recently got from one of the major networks and I think we’re going to follow it with our future titles. That is just about the worst press release ever. It reads like lipstick on a pig and totally turns me off your game. However, I’ve heard from other sources it’s actually very slick game with good mechanics. Ever heard the phrase “don’t pee where you drink” ? It might irk you that the developer name wasn’t mentioned, but has it occurred to you that maybe that’s part of Big Fish’s success? The press release ultimate is to inform game player (customers!) of a new product AND to strengthen the big fish brand, to build up more and more loyal returning customers. Why would they want to fracture that excercise by giving the developer exposure? They want customers to Google for Big Fish, not Codeminion. In the end you benefit from their aggressive marketing. Why complain before you’ve even begun to reap the rewards? Arby. When creative people work for the better part of a year on a title then they should expect that they will get credit for their work. BFG have built a large online portal but they didn’t make the game. Not giving credit makes business sense for them if developers don’t balk… but it’s a big mistake for developers to do so. BFG don’t own the eyeballs and there are other ways to get product out there. … It is in THEIR contract. Anyway, I think you will be feeling like an idiot when you receive your first royalies 😉 entering the top 10 is a very good things. You might not have enter it (or so quickly) if you didn’t have an exclusive with them. The whole situation does not change the fact that Saqqarah is a very nice, well polished game. This problem might lead to situation where developers will put their games on BigFish with a significant delay so more clients can buy the game for normal price. In my opinion ppl who buy casual games are not oriented around one portal and if BigFish does not have a game they like they will look for it elsewhere and if a game is good enough they will pay the full price.There is also one think most ppl seem to miss. As dollar value gests weaker and the prices go higher on almost every market the casual games prices stay still and in case of big fish go significantly down, additionally if you compare quality of older games to the ones made today you can come to conclusion that the cost of production has increased significantly. You have a right to be angry, certainly, about the press release. It would be wise to wait for you first paycheck like my_name has suggested and compare the different publishing deals from a strictly financial basis. In the end, you will need the green to make the games and some times you need to go with the deal that makes the most sense for you bottom line. This is very funny how many people link the moral judgment of BigFish actions with how much they will earn us. In my opinion this is totally besides the point. The size of the paycheck will not make the business practice they did better or worse – at least not in this particular case. BigFish may be the single biggest casual website on the Internet but they are certainly not bigger than all other portals together, like some people have started suggesting. To give you an example with our best selling game so far (Magic Match) which was launched on over 13 different channels BigFish accounted for 7% of the total number of copies sold. I know they’ve grown over the last two years, but I’m guessing they still don’t have more than 20% of the online casual downloadable game market share. I’m not correlating business practice with the moral judgement of Big fish. as i understand, and as you have stated, they have apologized for what they have done and promised not to let it happen again. It was a mistake that they have owned up to – which is more than you can say for other channels. what concerns me is that you may put your ‘business’ in jeopardy because of a (possibly) over exaggerated emotional response to feeling ‘slighted’ by them. I buy just about all my games from Big Fish. I knew I would be buying at least 12 in a year, and when I saw that I could get them for $6.99 I happily signed up. Never thought of it as loyalty, just sensible. I am loyal though. BFG has provided really excellent support, has an attractive looking site, and their game player works well. I do sympathize with the developers. I have no idea what the payment arrangements with them are. I’d like to suggest that the rational thing would be for developers to be paid a flat rate per game sold, regardless of the selling price.